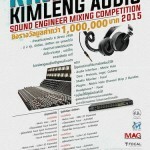 BANGPLEE, SAMUT PRAKARN, THAILAND: Metric Halo's distributor for Thailand, Kimleng Audio, is hosting KimMix 2015 - Sound Engineer Mixing Competition. The contest is going on NOW, and ends March 8th. Who can participate? Students & Free Style Sound Engineers. *Must live or work in Thailand and complete Kimleng Audio’s “How To Use Metric Halo Plugins & Hardware” training seminar to be eligible. SAFETY HARBOR, FLORIDA: Metric Halo proudly sponsors the Seattle Composers Alliance 2015 Spring Fling, with the donation of two MH Production Bundles for their online auction. "The SCA is a non-profit group of professional composers, students and others interested in composing for film, video games and other media as well as concert works. We present a variety of educational and networking events throughout the year, and will soon hold our annual fundraiser to support these efforts," says Brian Monroney, guitarist, composer, long-time Metric Halo user and Seattle Composers Alliance Board Member. 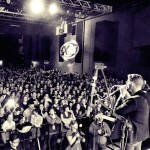 PORTLAND, OREGON: “These days, I feel like the only way for a band to succeed is to be self-contained – the band has to be able to take care of everything for itself. 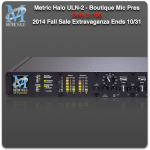 The Metric Halo ULN-8 contains mic pre’s, converters, routing logic, and DSP, and it’s absolutely world-class. Anyone who is trying to set up a recording rig or a live rig from scratch knows that it can be an overwhelming task to sift through the tangle of possibilities. I say, ‘Bypass it all! You’ll find everything you need with zero-compromise quality in the Metric Halo ULN-8.’” So says producer/engineer/musician Brandon Rush, who, together with longtime friend Kyle Sears, fronts Priory, an up-and-coming band from Portland, Oregon that recently signed to Warner Bros. When Hill needed a new interface several years ago, he spoke with the folks at Australia’s Audio Chocolate. 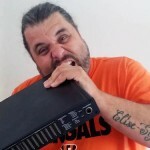 In the market for a Stereo Mic Pre? How about 2 channels of boutique ultra-low-noise Mic Pre for only $1195? Or a stereo transformer-coupled mic pre for only $1795? Metric Halo has your answer: the ULN-2. At these prices, we're including the 2 ADCs, 4 DACs, AES/SPDIF/ADAT/DSP and computer interface for FREE! ...Until 10/31/2014, that is. It's Metric Halo For Legendary Mastering Engineer Herb Powers, Jr.
NEW YORK, NEW YORK: “We’re in the business of correctly preserving a musical vision that occurred at a moment in time,” says legendary mastering engineer Herb Powers, Jr. “Sure, we make it commercial and tweak it up a bit, but really we’re preserving that picture as best we can.” Powers’ philosophy – which is about the soul of the music and not its technicalities – has clearly worked for him: the veteran mastering engineer has earned numerous Grammy Awards and nominations and innumerable Platinum- and Gold-certified albums. 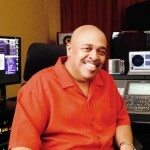 His list of clients includes Mariah Carey, Alicia Keys, Justin Timberlake, Usher, Nelly, Missy Elliott, Lauryn Hill, Salt-N-Pepa, Run DMC, Afrika Bambaataa, Outkast, Toni Braxton, Babyface, Puff Daddy, Jennifer Lopez, Pink, and countless others. Among Powers’ trusted tools are Metric Halo SpectraFoo sound analysis software, a Metric Halo ULN-2 A/D/A interface, and, more recently, Metric Halo plug-ins. 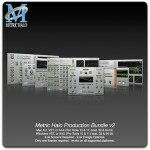 Metric Halo is pleased to announce the immediate availability of version 2 of its Production Bundle plug-ins. The new plug-ins provide a comprehensive set of tools offering Metric Halo’s signature sound quality at a compelling price. SAFETY HARBOR, FLORIDA: After earning a degree in classical guitar and finding that the world does not value classical guitarists as it should, Maurizio Argentieri retooled his education and fueled his passion for sound on the other side of the microphone. He dove in just as the industry was lurching from its analog foundations to its digital future, and he secured a very educational three-year gig as the on-location sound mixer for a small documentary crew that filmed Greenpeace activities around the world. “From there, I dreamed of recording sound for movies,” he laughed. Twenty years later, it’s clear that his dream became a reality. 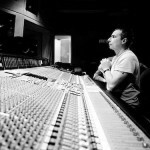 Argentieri has recorded and mixed for directors such as Mario Monicelli, Marco Bellocchio, Bernardo Bertolucci, Giuseppe Bertolucci, Mel Gibson, Barry Levinson, Spike Lee, Woody Allen, Ridley Scott, and Michel Comte. Comte is the visionary behind The Girl From Nagasaki, and Argentieri used his Metric Halo ULN-8 to record and tweak almost every aspect of the trans-opera’s sound. 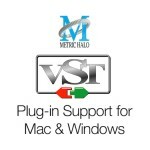 SAFETY HARBOR, FL: Metric Halo is pleased to announce the immediate availability VST based versions of all Metric Halo plug-ins. These plug-ins are supported on both Windows and Mac OS X. In addition to VST, the plug-ins also support Pro Tools AAX on Mac and Windows, and Audio Units on Mac. All of the plug-ins run in both 32-bit and 64-bit hosts on all platforms. 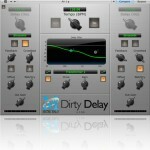 SAFETY HARBOR, FL: Metric Halo is pleased to announce the immediate availability of its brand new MH Dirty Delay plug-in.